The entire letter can be found here. I think you can sense Patrick’s sorrow. Yet he was also sorrowful about the apostasy of the “Scotti and Picts” who collaberated in these raids leading to capture and murder. The Scotti and Picts were probably tribes who had been converted to the Christian Faith but then left it (“apostasy”, apo stasis, lit. leaving the stand, the place where they stood). Patrick was angry about their apostasy as a pastor should. They were now spiritually dead and had killed the newly alive in Christ. Patrick confronted them all and I would guess at risk to his own life. He was brave in Christ. We need more brave men as pastors and bishops to confront apostasy, both here and abroad. We need more brave political leaders who will protest the massacre and imprisonment of Christians in other nations. Hear Patrick’s pain and ask as you read: Where is the sorrow of the Church and her pastors in these gray and latter days? Is there no orthodox faith in the Lord and His literal Word over the massacre of Christians, spiritually and physically? St. Titus, like Timothy with whom he is often associated, was a friend and co-worker of St, Paul. Titus was a Gentile, perhaps a native of Antioch, who accompanied Paul and Barnabas to Jerusalem when they brought assistance to the Christians in Judea during a famine (Acts 11:29-30; Galatians 2:1). It is not known if he accompanied Paul on his first or second missionary journeys, but Titus was with him on the third one, when he helped reconcile the Corinthians to Paul (2 Corinthians 7:6-7) and assisted with the collection for the Church in Jerusalem (2 Corinthians 8:3-6). It was probably on the return to Jerusalem that Paul left Titus in Crete (Titus 1:4-5). Afterward he is found working in Dalmatia (2 Timothy 4:10). According to tradition, Titus returned to Crete, where he served as bishop until he died about AD 96. This past Friday was the Feast Day of St. Timothy, yesterday, January 25th, the Conversion of St. Paul, today St. Titus and tomorrow the Commemoration of St. John Chrysostom, Preacher. When I began at my third congregation, the first one in the south, I went to see a homebound man, in a wheelchair, at his home and when I came in, in a Southern accent said, “The preacher man is here!” These four days of feasts and a commemoration are all about preacher men. The Apostle Paul tells his brother Pastor Titus that through the preaching of Word that the fulness of the truth was “manifested”. The Greek word is very much akin to the name of this liturgical season: epiphany. God makes manifest His will of salvation by grace alone through the preaching of the Word which means the Lord calls faithful preachers. This is a good day to give thanks to the Lord for faithful preachers especially the men you have known, bringing the Word to pulpit Sunday after Sunday, at the hospital, in a home bound member’s home, in a school, in classes, at the grave. As you give thanks to the Lord let your thanks be known to your pastor as well. The two words in the good work of being a father, or a mother, are the authority of “no” and “yes”. You can’t do this, you should not do that, be careful and the like. Yes, come, let us worship the Lord, Yes,the Lord has forgiven you, Yes, I love you and will care for you. “Fathers of a nation”, that is government, usually only use the word “No”, the political use of the Law for restraining evil (cf. Romans 13:4) . “Fathers of a household” meant for Luther the household with staff, that is, maids and servants. Since many of us do not have such (! ), and watch Downton Abbey wishing we did (! ), this portion of the catechism seems irrelevant, but some have suggested that the modern equivalent is our places of work and our superiors at work. The boss must also apply with wisdom “no” and “yes”. It is clear mothers and fathers do as well, and so do pastors. He (the pastor) must hold firm to the trustworthy word as taught, so that he may be able to give instruction in sound doctrine (yes) and also to rebuke those who contradict it (no). But in our forever affirming, self-esteeming, always should feel good culture and society, the role of pastor actually rebuking, saying “no” to false doctrine spoken by the baptized, is even actively despised. This means that the reality of sound doctrine, that Christ saves sinners, is also blunted. Some pastors like to think of themselves as “coaches”, constantly cheering on the team…but that’s a cheerleader and an actual sports’ coach has plenty of rebukes! Pastors are not to relish in rebuking, and they do not, because it is not pleasant to receive discipline or to discipline, but for the sake of the “sound doctrine”, it needs to be done at the right time. The pastor is also “disciplined” in his comportment according the humility of knowing that the Lord loves me a sinner as well, but when that sinfulness is not acknowledged and confessed (cf.1 John 1:7-9), and false doctrines are sought to justify sinfulness, something has to be said. Pray for your pastor or priest and minister as he teaches you God’s Word of No and Yes, Law and Promise for you to love and know Jesus Christ! 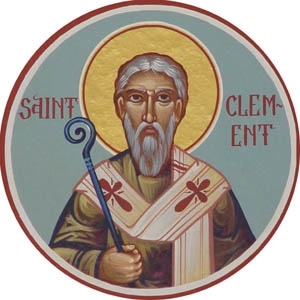 Almighty God, Your servant Clement of Rome called the Church in Corinth to repentance and faith to unite them in Christian love. Grant that Your Church may be anchored in Your truth by the presence of the Holy Spirit and kept blameless in Your service until the coming of our Lord Jesus Christ, who lives and reigns with You and the Holy Spirit, one God, now and forever. Reflection: In the bio above and in the quote below the word “fix” is employed. In the Prayer of the Day for the 5th Sunday after Easter, the Church prays, “Grant that we may love what You have commanded and desire what You promise, that among the many changes of this world our hearts may be fixed where trues are found, through Jesus Christ, Your Son, our Lord…”. I like to play off that word “fix”. Our hearts, that is, our wills are fixed, that is, guided, repented, repaired in the fruit of the joys of His crucifixion and resurrection: His forgiveness for us, in us, with us, His life in our lives. We can not repair our hearts, our wills on our own. No one did heart surgery on himself, one needs a physician. We are fixed by fixing our hearts and eyes on Jesus Christ and that “fix” is prayer, the prayer of faith in the Lord, in Whom we are made one in Christian love. Let us then, men and brethren, engage in our service with complete earnestness under his faultless order. Let us consider those who serve under our military commanders, with what good discipline, subordination, and obedience they carry out orders. Not all are prefects or tribunes or centurions or captains of fifty and so on, but “each in his own rank”(I Cor. 15:23)carries out orders under the emperor and the commanding officers.The great cannot exist without the small; neither can the small exist without the great: there is a certain mutuality in the whole, and this is beneficial to it. This past week Sunni militants have taken over the 2nd largest city in Iraq. The following quote is from a recent letter from Roman Catholic priest, Fr. Najeeb who lives in Mosul. The full article is in First Things and can be found with this link. As he asks: pray for them. Bad news. I write you in a situation of violence in Mosul that is very critical and even apocalyptic. Most of the inhabitants of the city have already abandoned their houses and fled into the villages and are sleeping in the open without anything to eat or drink. Many thousands of armed men from the Islamic Groups of Da’ash have attacked the city of Mosul for the last two days. They have assassinated adults and children. The bodies have been left in the streets and in the houses by the hundreds, without pity. The regular forces and the army have also fled the city, along with the governor. In the mosques, they cry “Allah Akbar, long live the Islamic State.” Qaraqosh is overflowing with refugees of all kinds, without food or lodging. The check points and the Kurdish forces are blocking innumerable refugees from entering Kurdistan. What we are living and what we have seen over the last two days is horrible and catastrophic. The priory of Mar Behnam and other churches fell into the hands of the rebels this morning. . . . and now they have come here and entered Qaraqosh five minutes ago, and we are now surrounded and threatened with death. . . . pray for us. I’m sorry that I can’t continue . . . They are not far from our convent. . . . Don’t reply. . . . The other time of the Church year the Palm Sunday Gospel of our Lord’s triumphal entry into Jerusalem is read is the 1st Sunday in Advent. Advent and Lent, beside rhyming, have this in common both are about the Incarnation, the , Word becoming flesh. The Lord shed the clothes of His equality with God, the form of God and took on human form, born of the Virgin Mary. Advent points us to the Word became flesh, the Son of Mary, wearing the mantle of mortality. Now in Lent and Holy Week, as the weight of His flesh sat upon that donkey, riding triumphantly to the defeat of sin and death, mankind’s sin and death, by bearing sin and death for us all. The donkey bore Him who bore the sin of the world and the crowds laid their cloaks on the road. No donkey, no man can carry the sin of the world, except the Lamb of God, true man and true God, 100%, 100%. 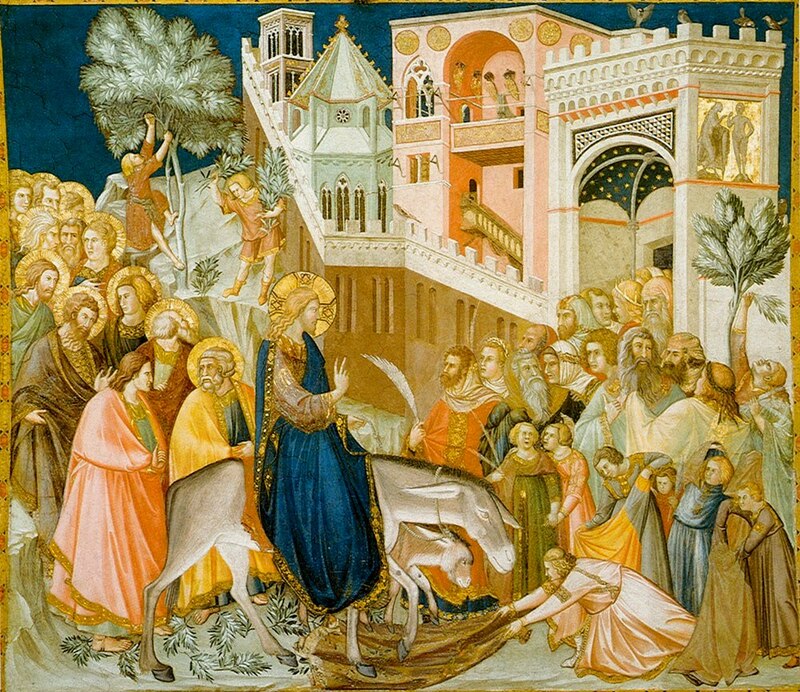 Natalie and I both noticed that the Palm Sunday hymns all mention children and she asked where are children mentioned in the narrative of the triumphal entry into Jerusalem? We heard it in the Matthew 21. The children in the temple, right after the triumphal entry, were crying out in the Temple, the Temple, the Lord’s House, Hosanna to the Son of David! The chief priests and scribes were indignant that the children were singing to Jesus. Earlier Jesus was indignant that the disciples were preventing the children from coming to Him. He said, for to such belongs the Kingdom of heaven. It is said, Christmas is for kids…so is Holy Week. All who receive His kingdom, His reign as a child, trusting our heavenly Father who sent His only begotten Son. “I thank you, Father, Lord of heaven and earth, that you have hidden these things from the wise and understanding and revealed them to little children;26 yes, Father, for such was your gracious will. Secondly, the laying down of the garment of sin reminds us that in Holy Baptism we are clothed in Christ, as it is written in Galatians 3: 27, for all of you who were baptized into Christ have clothed yourselves with Christ. Christ Jesus is the Church’s “Sunday best”. He is your Sunday best. “In the last time there will be scoffers, following their own ungodly passions.” 19 It is these who cause divisions, worldly people,devoid of the Spirit. 20 But you, beloved, building yourselves up in your most holy faith and praying in the Holy Spirit,21 keep yourselves in the love of God, waiting for the mercy of our Lord Jesus Christ that leads to eternal life. 22 And have mercy on those who doubt; 23 save others by snatching them out of the fire; to others show mercy with fear, hating even the garment stained by the flesh. The Lord’s Sunday Best, His mercy, is for your neighbor as well. Baptized into His Name, the Name above all names, washed us in His forgiveness or absolution. When we are tempted, we call upon the Name of the Lord. When we fall, we call upon the Name of the Lord. Jesus’ light would not shine this week. The One who was transfigured before Peter, James and John would be disfigured, as the Prophet Isaiah foretold beyond all recognition and human semblance. Stricken, smitten and afflicted by God, a Man of sorrows and acquainted with grief (Isaiah 53) would Himself willingly cast aside the beauty of His cloth, seamless and whole and die naked on the cross. The crowds and the children sang Hosanna, literally, Lord help, Lord save. The children knew only Jesus could so ride by Himself into Jerusalem. The Lord Jesus entered into the world in His first coming, His Nativity, so He could enter into Jerusalem and so He will come again a third time in the Resurrection on the last day. Thy Kingdom come is for that Day and for this hour now. He entered into Jerusalem so He enters His Church daily, and has made our bodies His temple receiving the fruits of His Cross, the fruits of the Holy Spirit. Our Lord came down from heaven and died on the cross and has entered my heart. Hosanna to the Son of David, blessed is He who comes in the Name of the Lord.